R.J. Riquier Inc: Ambition With Tradition. 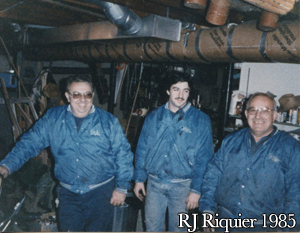 R.J. Riquier Inc. is a family-owned business that has been serving Eastern CT for over 50 years!! Allen, the 3rd generation of Riquiers to own the business, holds the highest level of licenses in the business for Plumbing, Heating, A.C. and Solar Thermal. Since the transfer of the business to Allen in 2009, R.J. Riquier Inc. has instituted updated and more proactive customer service standards. Just call us when you need service for your plumbing, heating or central air systems. Let us be your “on-call” service team! And, every call will be returned as soon as possible but at the latest, by the end of the same day you call us. R.J. Riquier Inc. is licensed and insured to service residential AND commercial properties; and handles emergencies as well as new construction. With the knowledge and expertise of three generations, we are considered experts for aging plumbing and heating systems. And with our techs continuing their education on the latest technology, we can educate property owners about the latest, most efficient and cost-effective products in the market (including going green! ), so they can make the right decision for their needs. Everything we install comes with 24 hour service for emergencies. Call or request a quote online today!